There’s two sides of the brown rice vs. white rice debate. On one side, conventional nutrition theory says brown rice is best because it contains all the nutrients. The other side which characterizes the Paleo school of thought says white rice is best because it doesn’t contain phytic acid that blocks nutrient absorption. Today we’re talking about rice and sorting through the misunderstanding and fear surrounding phytic acid (a.k.a phytate). Listen as we clarify the sometimes misunderstood effect phytic acid has on mineral absorption, which foods contain phytates, and how phytates can actually have positive health effects. 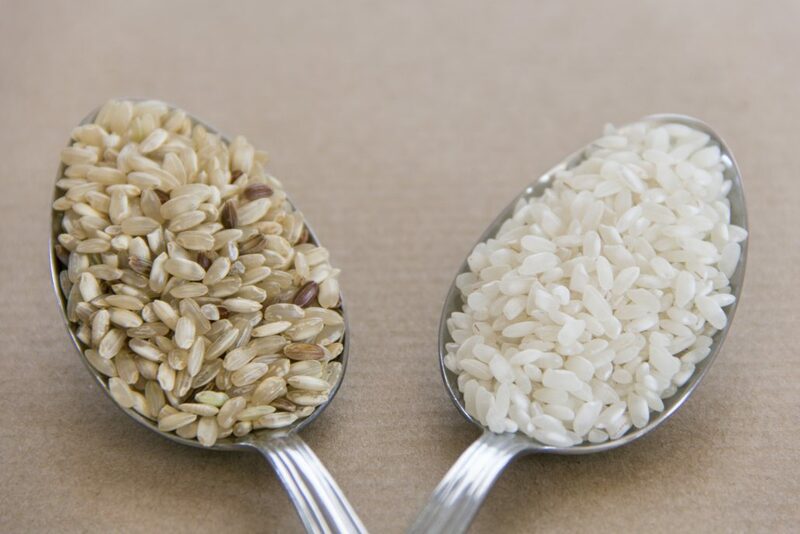 You’ll be able to decide if brown or white rice is best for you as we explain who should be more cautious with the amount of phytic acid in their diet and even touch on the subject of arsenic content in brown rice. You’ll even hear how to reduce phytic acid content in brown rice. Be sure to join us! Chris Kresser’s Arsenic in rice: how concerned should you be? Kelsey: Hi everyone! Welcome to episode 129 of The Ancestral RDs podcast. I’m Kelsey Kinney and with me as always is my cohost Laura Schoenfeld. Kelsey: We are Registered Dietitians with a passion for ancestral health, real food nutrition, and sharing evidence-based guidance that combines science with common sense. You can find me at KelseyKinney.com, and Laura at LauraSchoenfeldRD.com. Over the next 30 to 45 minutes we’ll be answering your questions about health and nutrition, and providing our insights into solving your health challenges with practical tips and real food. Stick around until the end of the show where we’ll be discussing some updates about our businesses and personal lives. Laura: If you are enjoying the show, subscribe on iTunes so that way you never miss an episode. And while you’re there, leave us a positive review so that others can discover the show as well. And remember we want to answer your questions about health and nutrition, so head over to TheAncestralRDs.com to submit a question that we can answer on an upcoming show. Kelsey: First of all, awesome to hear that this addition of rice has been a positive thing for you! Laura, I’m sure you as well as me, we’ve seen this happen time and time again within our own clients where something as simple as just adding a little bit of rice to their nighttime meal or in the morning or something makes a really big difference for somebody overall. Laura: Yeah, definitely. I feel like rice is one of those super easy carbs and a lot of people tolerate it pretty well, so often a food that I have my clients adding in. Kelsey: Yeah. I think this question about brown or white rice is actually a really interesting one because I feel like for a lot of the questions that we get about nutrition, there’s some amount of research behind stuff, but nutrition is an interesting science to say the least in that there’s a lot of problems with nutrition science. But there’s actually been quite a bit of research on the best kind of rice to eat for maximum nutrient absorption because lot of cultures around the world consume rice as one of their main staples for their diet. So researchers have wanted to find out if there’s anything that they can do especially for people in developing nations where rice might be one of the only things that they’re eating. They’re not eating a varied diet that has a lot of nutrition overall and they’re getting a good portion of their nutrition from rice, and so then the absorption of nutrients from rice becomes very, very important. It’s kind of cool that we actually have quite a bit of research to pull from for this question. I know this is something that’s talked a lot about in especially the Paleo and ancestral communities, and even like Weston A. Price communities. We’re all concerned about nutrient absorption obviously, but specifically with rice it comes down to this idea about phytic acid. Phytic acid prevents the absorption of nutrients, especially minerals like iron and zinc, and to a lesser degree calcium, but still calcium as well. You may have heard of phytic acid or phytates called anti-nutrients before. This is pretty common especially when you’re getting started with a Paleo or ancestral type diet. In a lot of the books that you’ll read or the blogs that you’ll read you’ll hear that you should avoid grains in particular because they’re high in anti-nutrients. That’s really what this is referring to, that term anti-nutrient. Or at least one of the anti-nutrients that that is referring to is phytic acid. Laura, I’d be curious to hear what you hear from your patients about this because I know at least for me, I think there’s a lot of confusion with my clients about how phytates actually work in that many of my clients tend to think that when you’re consuming phytates in your meal anytime during the day, it’s like pulling from your own nutrient store. So it’s not blocking absorption of minerals that you’re eating, it’s like actually depleting your own nutrient stores. Have you ever heard that from your clients before? Laura: I think so. I feel like it’s confusing because the phytate argument has to do with the long term effects of mineral depletion and so it gives this impression that like it’s actually removing minerals from your storage. But it’s definitely more of an issue where you’re just not absorbing all the minerals in your food because of the phytates and then you eventually develop a deficiency because of that. Kelsey: Yeah, absolutely. Just to clarify exactly what Laura just said is that when you’re eating phytates in a meal, so let’s say you are eating brown rice. Brown rice contains some phytates. That essentially is blocking the absorption of minerals like iron, and zinc, and calcium from the food that you’re eating within that meal. So it’s not pulling anything from your own stores of nutrients. It’s just blocking your own absorption of the nutrients that you’re consuming at that particular time that you’re also eating phytates. Even if you ate something in the morning that was really high in iron, or zinc, or something, but then you ate some rice later in the day, that does not block those nutrients from entering your system. It just has to be consumed at the same time that you’re eating foods high in those minerals. I hope that clarifies that a little bit. I know for me I get a lot of questions about that from my clients and they want to make sure that they’re not depleting their stores of these kinds of minerals when they’re eating some of these things that are higher in the phytic acid. One thing I think is important to remember with the phytates in food is that for the most part something like rice with the phytates in it, it’s going to mostly bind to the nutrients in the rice. I know you’re going to talk about this, but it would have to be free phytic acid that’s binding to minerals from other foods. That might happen a little bit, but in most research I would say that it’s not showing a ton of nutrient deficiencies if your food in general is high minerals. Laura: If you’re eating right like a steak or something, it might have a tiny bit of reduction in your iron intake, but it’s not that big of a deal. Whereas if you’re eating like a plant based form of iron that also has a lot of phytic acid it in that plant, then that’s probably going to be a bigger issue. I feel like in the sense of a Paleo diet where you’re eating meats and stuff, usually you’re not going to have enough of an impact from phytates in food to actually get even like a significant amount of the nutrients from those other foods into it. Kelsey: Totally. And again that’s sort of why it is something that researchers look at for developing nations where people are consuming rice as one of the main foods that they’re eating. Kelsey: They might be eating rice and like one other food as the basis of their entire diet. That’s where it becomes way more important that we think about phytates, whereas like you’re mentioning here in the context of a Paleo diet or an ancestral diet, you’re eating meats, you’re getting these minerals elsewhere and it’s really, really easy for you to kind of overcome even a fairly high phytic acid intake. Let’s talk a little bit about where you get phytic acid because I think this is a problem I see in the Paleo community specifically is that we hear about phytates and anti-nutrients as being a problem with things like grains and legumes, but they’re actually also present in pretty high amounts in seeds and nuts as well. But we kind of conveniently forget that part when we’re talking in a Paleo context because as I’m sure most of you know, nuts and seeds are highly recommended on a Paleo diet and often people are eating large amounts of these. I’m happy to see that that’s becoming less and less of a thing lately. People like Chris Kresser are saying only eat a handful of nuts a day and kind of putting limits on that. But I know at least for myself when I first started eating Paleo, I mean I ate so many nuts it was ridiculous. I’m sure my phytate intake was way, way higher than it was prior to starting Paleo. And I think Laura, you’ve kind of said that in the past, too, like you ate a lot of nuts when you started Paleo, too. Laura: Yeah, it’s kind of funny to think back at that time of my nutritional approach because that was gosh, what is it, 2017? That was probably like six years ago. Oh my gosh, I’m so old. It’s just funny to think back. I used to have this like gallon sized bag of mixed nuts that I used to eat from and I’m like man, I think I don’t even have nuts in my pantry at this point. Kelsey: Yeah, same. That is kind of funny to think back on. Phytic acid is present in a lot of different foods and it’s also really variable within those foods. Like you can have almonds that some of them contain like 40 percent phytic acid and some of them contain 5 percent. So they range a lot in their phytic acid content. It’s hard to really know exactly how much you’re getting, first of all. But also we tend to hear at least in the Paleo world that phytic acid is really a negative thing and we tend not to hear the positives about phytates. Phytates are actually pretty strong antioxidants and they’ve actually been shown to prevent cancer as well as kidney stones. They’ve actually got quite a bit of good things going for them, but we don’t really hear about that in the Paleo world, and not really even in like the ancestral or Weston A. Price world either. I think we tend to really focus on the nutrient absorption piece of it and we don’t hear about those benefits. Point being is that we don’t necessarily want to avoid phytates completely. That would be pretty hard to do, first of all. But they do have beneficial effects, so we want those benefits, obviously. And also avoiding phytates completely or even significantly would mean avoiding otherwise really healthy foods like nuts, and seeds, and legumes, or changing them a lot or processing them in a way that for a lot of people is very time consuming. Not that there’s anything wrong with processing them in a way that helps or reduce phytic acid content. We’ll talk about that a little bit more later. But if you really wanted to take out phytates completely, it would be pretty impossible unless you’re taking out all of these foods. Laura: Plant foods in general. Laura: Leafy greens. You basically wouldn’t be able to eat any plants. Kelsey: Exactly. I find that people tend to think like phytic acid, and phytates, anti-nutrients; they’re terrible, we don’t want to eat them at all. When in reality as usual, it’s very nuanced and it’s not necessarily a 100 percent good thing or a 100 percent bad thing. It’s kind of somewhere in the middle as with a lot of things in nutrition. It’s not bad to eat phytic acid or to consume that in your diet. And in fact, like I said, there’s a lot of benefits that you can get from phytates, but we don’t tend to hear about it and we tend to focus mostly on the negative stuff. Then there comes the issue where, at least when it comes to nutrient absorption, this is where I have like a bigger problem with how this is portrayed in the Paleo and ancestral health world. Because for people who are eating a balanced diet and they’re not high risk for deficiencies like iron and zinc, consuming phytates with your meals; not a huge deal. Like we’ve been talking about, it really just becomes very important for somebody who is getting a huge percentage of their diet from things that tend to be very high in phytates, or not even very high, but at least you know it’s blocking a good percentage of those nutrients that they would otherwise be getting from that food. So again, that’s why researchers have been studying things like rice and how to reduce phytate content, and how much zinc and iron are in rice, and how we can get that to be more bioavailable for people. It’s really because there’s people out there who that’s maybe 80 percent of their diet and so it becomes very, very important for them that they’re absorbing those nutrients because otherwise they’re very nutrient deficient. That’s why we care in the research sense. When we get all hung up on phytates, and anti-nutrients, and things without taking into context our food environment, and how we eat, and the fact that we compared to a lot of people have pretty varied, balanced, nutrient rich diet, I have a problem with that because it makes people fearful of things that are otherwise healthy. I’m sure, Laura, you’ve had this experience, too, in your own practice where people honestly are scared of eating things that have “anti-nutrients” and they feel like they’re being “bad” when they’re eating those kinds of foods. Laura: Yeah, I mean it’s not the most common thing as far as what people would be afraid of, but I feel like there is that just underlying belief that they are things to be avoided. Honestly I feel like it’s a pretty incomplete understanding of what foods even contain phytates. It’s just all sorts of inaccuracies when it comes to that. Kelsey: Yeah, absolutely. When we’re thinking about phytic acid content in our food, for those of us who are eating a well-balanced diet, and we’re getting a lot of different types of food in our diet, and especially if we’re eating meat, like Laura mentioned before, meat is high in both iron and zinc. So that really helps to prevent us being deficient in those minerals. Phytic acid intake for us if we’re eating meats and a varied diet in terms of other plant foods becomes way, way less important and you’re not really going to get much if any detrimental effects from consuming some foods that are high in phytic acid in that context. And in fact, in that context really we’re going to start talking more about those benefits that we see where people are eating phytates because now we don’t have to worry about those nutrient deficiency risks that other people who are consuming way more rice or other grains, or nuts and seeds as the majority of their diet that they are worried about. We actually kind of get the best of both worlds, honestly, because we don’t have to worry about being nutrient deficient in those minerals, but then we also get the benefits of consuming phytates. So again, that’s antioxidant cancer prevention and kidney stone prevention. All good, all pretty good things, I would say. If you’re somebody who is eating meat, that’s probably the most important thing I would say, if you’re consuming meat and you tend to eat a pretty varied diet…and I say that was like really loose definitions here because I know Laura and I always talk about eating a really varied diet and how nutrient diversity is very important. And absolutely it is, but in this context it’s more just that you’re not getting like 80 percent of your nutrients from things like greens or nuts and seeds. If you’re just eating even like a standard American diet I would say, and you’re eating meat, you’re probably not at risk for phytates being a huge problem in your diet. Now of course you could do a lot better if you’re eating a standard American diet and you’re probably going to eat less phytates kind of getting on to a more Paleo or ancestral diet. But the point being is that you really don’t have to worry that much about your phytate content. But you can do some things to help lower your phytic acid intake. And again, this is not a huge deal. If you’re eating meat, if you’re eating a varied Paleo or ancestral diet, to be honest you don’t have to worry that much about it. Like if I have a client who doesn’t really want to prepare brown rice in a proper way according to like Weston A Price type…when I say proper preparation, that’s sort of what I’m referring to…and they’re only eating it occasionally, not a big deal. I’m not going to make that a big deal in their life to really make them start to incorporate that process for something that they’re only eating once in a while. If you’re like going out to eat every once in a while and you prefer the taste of brown rice over white rice, sure, have the brown rice. Don’t worry too much about it. Overall your diet is great and a little bit of extra phytic acid every once in a while is not a big deal at all. But if you’re cooking at home and it’s not a big deal to add some steps to help reduce your phytic acid intake, I think that can be a good idea. The first option of course is to use white rice. The reason white rice has less phytic acid is because you’re getting rid of that outer layer of rice and that’s where the phytic acid is stored. You don’t really need to do anything special with white rice and that’s why it’s the easiest option of course because you can just cook it as normal. You don’t need to do any soaking, or fermenting, or anything like that to help reduce the phytic acid content. For most people obviously that’s super easy and because you don’t have to do anything extra to it, that’s what a lot of my clients end up choosing. I work with gut health clients, too, so that’s another reason why we tend to move more towards white rice just because it also tends to be more tolerable for them. So that’s a really good option. If you’re not eating rice in general to get nutrients, so meaning if the rest of your diet is very nutrient rich and you don’t need the nutrients in white rice to help bring up your nutrient content of your diet, then you really don’t need to worry about getting those extra nutrients that you would get from brown rice. That’s the benefit of brown rice is that you’re going to get a little bit more nutrition from that. But the caveat here is that you have to make that nutrition bioavailable. That means that we have to try to get rid of the phytic acid that brown rice contains in its outer layer so that you can then absorb the nutrients that it contains. I was looking at a lot of different research just kind of looking at like soaking and fermenting and what the best option is to get rid of the most phytic acid content possible. And it was kind of funny because I was looking in Google Scholar and PubMed and was reading this article, and then I was doing a little Googling just to see what our Paleo and ancestral peers kind of had to say about this. I actually found an article that Stephan Guyenet wrote in 2009 about this scientific article that I was reading in which he had actually contacted the study of article writer and director and asked him for specific directions on how they actually soaked the brown rice to get rid of I think it was 96 percent of the phytic acid content. That’s pretty darn good. If you can get rid of 96 percent of the phytic acid content, obviously you’re going to be absorbing quite a bit of the nutrition that’s contained in that brown rice. The method that he got from that study author was to take brown rice and soak it in dechlorinated water for 24 hours at room temperature. And then what you do from there is you reserve about 10 percent of that liquid that you soaked the rice in and you save that for the next time you make brown rice. So the first time you do this, your rice is not going to have a whole lot of its phytic acid content reduced because you’re basically just soaking it for 24 hours, which does something to reduce the fiery acid content, but not major. But then the next time you make brown rice, you take that 10 percent of the reserved liquid that you kept before and you add that to your soaking liquid. So again you’re going to soak it for 24 hours at room temperature with 10 percent of the previous soaking liquid and 90 percent new dechlorinated water. And then you basically just keep doing that process. Once you take that water out of your soaked rice, you save 10 percent of it. You use that the next time that you make rice and so on, and so forth. Basically over time that process gets better and better at removing phytic acid content. After a little while you get up to that 96 percent of fighting acid removal when you’re using this reserved liquid to help break that fight it gas it down. The reason that they think that this works is because first of all you’re kind of fermenting the liquid when you use the reserved liquid and that helps to lower the pH. The lower the pH, the better you can break down phytic acid. Then also because it’s fermented, you’re getting microorganisms that can help to degrade phytase taste as well. Basically by the end of this process once you’ve done this a few times to kind of buildup that fermentation potential, you’re going to be able to get rid of almost 100 percent of the phytic acid contained in brown rice. At the end of the day I would say you don’t have to worry about fighting acid really unless you’re somebody…let’s say you’re a vegan who you’re not eating meat, obviously, so you are going to tend to be more at risk for things like iron deficiency and zinc deficiency. Then you’re going to want to pay a lot more attention to phytic acid content and you’re going to want to either eat white rice, or I would say in that particular scenario I would recommend that you do the brown rice, but you properly prepare it so that you’re absorbing the maximum nutrition that you can from that brown rice. But if you’re not a vegan and you’re eating meat, you’re eating a varied diet otherwise, you’re not going to be really at risk for iron deficiency or zinc deficiency unless you have other things going on. In that case you can do either of these, so whichever one you prefer. Like if you just like the taste of brown rice better than white rice, you can certainly do that process. I know for me I actually like the taste of white rice better, so that’s what I tend to use because it’s not something I’m really eating all that often anyway and so I’d rather just eat what tastes good. What about you, Laura? Laura: Honestly when I was listening to you describe that method, I’m just like, yeah I’m sticking with the white rice. Even if I liked the taste of brown rice better, I wouldn’t be bothering with that. It’s like way too much work. Kelsey: That’s what most people think, too. I mean I have a lot of clients that they get really into this stuff. I know I was like very into properly preparing things when I kind of first got into Weston A. Price and stuff, but eventually life takes over a little bit I think and you’re like I don’t have time for that. Kelsey: It’s just too much to bother with. I agree. Even though it doesn’t sound that hard, I just know that every time I go to cook rice, I’m not going to want to do that whole process. Laura: Yeah. And I mean like we were saying before, the amount of phytic acid in the rice could be negligible. Laura: And if you’re getting minerals from other foods….I think that kind of process might be better for people who don’t digest the rice well whereas if you’re just concerned about phytic acid, it’s definitely not worth it in my opinion. Kelsey: Yeah, and I would say just because you brought up digestion here, that’s another group of people that I would be thinking more about phytic acid with because those people with major gut issues, they’re generally not going to be absorbing their nutrition very well in the first place as we’re like dealing with these major gut issues and getting them to a point where their gut is healed and is able to absorb all the nutrition that they’re eating in their food. That’s another group of people that I would want to reduce their phytic acid intake as much as we can within reason because I’m not really worried about them getting the benefits of phytic acid in that case. I’m more worried about preventing nutrient deficiencies. Especially for something like zinc which is really important for gut health, I want them to be getting as much zinc from their food as they possibly can. Like I was saying before, most people with gut health problems are going to tolerate white rice a bit better than brown rice even if it’s soaked and everything a bit better. I tend to just recommend white rice first of all obviously just because it’s easier, and then second of all because again it tends to be more tolerable for people with gut health issues. If you are somebody with major gut issues, I’d say you want to pay a little bit more attention to this as well at least until you’ve healed. And once you heal and you feel like you’ve repleated all of your nutrient stores, you’re pretty much back to normal, you’re 100 percent, then in that case at that point you can be less concerned about your phytic acid intake. Let’s just kind of overview the people who should be thinking more about phytic acid content and making sure that they’re not overdoing it in that sense. I think really my main group would be vegans with vegetarians as less of a concern, but still something you at least want to think about and kind of go through your diet and say okay, where am I getting iron? Where am I getting zinc? Where am I getting calcium? And if I’m not getting a whole lot of those nutrients, then yeah, maybe I want to be a little bit more concerned about how much phytic acid I am consuming. And then like I was just talking about people with health issues. Any other groups you’d add to that, Laura? Laura: I don’t think so. Like I said, I feel like some of this stuff can be a little over the top and the things that solve the problem are generally a lot easier when it…I’m just trying to think of how to describe this…like if you’re eating a varied diet. And again with the GI stuff, obviously that’s going to make an impact on a lot of different foods that they’re choosing and it goes way beyond just like phytate, and rice, and stuff. But sometimes I think the people that are needing to worry more about this stuff are people that actually would be better off making other changes to their diet, if that makes sense. Kelsey: You’ve got bigger issues, basically. Laura: Right. So that’s why I’m like I think it’s good to answer this question because I know a lot of people are wondering about it and there’s a lot of information on the Internet about why you might want to do different types of rice. I think one thing one thing about brown rice that we didn’t really talk about is the arsenic content of brown rice over white. So that would be another reason why even if you can reduce the phytic acid in brown rice that you might not want to be doing brown rice over white. Kelsey: Did Chris Kresser have an article about the arsenic content in rice? Because maybe we can link to that. It’s my brain somewhere. Laura: Yeah, he definitely did. Let me just see if I can find his article because I think his article talks about when you should be worried and when you shouldn’t. Let me just see. I think white rice in general was okay. I know that he didn’t really suggest most people to eat brown rice anyway regardless of the arsenic content. Laura: He has a link to a PDF in that article talking about different brown rice brands and which ones have more or less of arsenic. I believe part of the problem is where the brown rice is grown. Different countries will have different arsenic content. Of course there’s going to be arsenic in a lot of things. Like water and stuff is going to have…like tap water I should say is potentially going to have arsenic in it. So it’s not that you’re going to 100 percent avoid arsenic in all areas of your life, but there is some potential concern for certain types of brown rice products that are a little bit higher in arsenic. We can definitely link to that article in the show notes and that way people can check it out and just see if there’s any brown rice products that they might be using more consistently and go for the brands that are lower in arsenic. But that would be another thing that as far as brown rice goes that I’m not super fond about it for. I personally brown rice occasionally like if I’m at a restaurant and they have brown rice as part of the dish. I’ve had brown rice that tastes good. I personally like it when it’s sprouted. I think it tastes better when it’s sprouted. I’ve had those before and I think they taste fine. I’ve definitely eaten brown rice before and recently even knowing what I know about brown rice. But at the end of the day it’s just one of those things that there really is no benefit other than the potential flavor. And even in that situation, it’s like okay, is it really that much more tasty that you would eat that versus white rice? Like I said, I’m glad we are discussing it because there is so much confusion about it and there’s just that general conventional nutrition belief that brown rice is better. There’s a lot of like misunderstanding in the average person when it comes to rice products. But hopefully this podcast answered some of those questions. At the end of the day like I was saying, if somebody is mineral deficient, then the rice that they’re choosing is probably not their biggest concern. Kelsey: Yeah, exactly. I think that’s a really, really good point because we tend to just get caught up in the minutia of a lot of things. I think especially our audience, we have a lot of people who have a history of orthorexia and things like that where they will get really caught up in these kinds of issues without looking at the bigger picture and seeing if there’s something else that’s kind of a bigger issue that they should be focusing on. I think this is a perfect example of that. It’s not super common that I see people get really, really concerned about phytates, but I definitely have people who come to me and just be like I don’t eat rice at all or any grains because of the phytate content and I’m worried about depleting my nutrients when maybe they’ve been a vegan for 10 years and like that’s the bigger issue here. Kelsey: Cool. I think that’s about it in terms of what I have to say unless you have anything else to add, Laura. I think we can jump into our updates for this episode. Laura: Yeah, I’m all set with the rice conversation and can definitely give our updates for today. Kelsey: Laura, how’s it been going lately? I know you’ve been working on your program like nonstop lately. Laura: Yes. This past couple of weeks has just been a little crazy. I feel this year in general has been a little crazy. I was so excited after the wedding thinking the wedding was going to be like my big stress moment for the year. I think I had like maybe a month of… I don’t even know, would we even consider that chill? I’m trying to think. This year has just been ridiculous. The last couple of weeks have gotten a little out of hand because I have the “Get Your Period Back” launch, which I think by the time this episode comes out I’m going to be like two weeks away from the course ending again. We’re in module four or five? No, four. Four out to six the week this comes out. It’s going well so far. I feel like the nutrition component has been released yesterday that a lot of people have gone through it. It’s funny that there’s a lot of people that are learning things that are what would seem to you and I kind of basic, but I think it’s something that people aren’t even aware of, which is why we create these kind of online programs. Because it’s like there are so many basic things that can be going wrong, but if you don’t know what it is, then you’re actually just kind of doing the same thing over and over that’s not working, It can be really easy to fix things if you’re made aware of what’s going on. But obviously you have to be made aware first. I think the information has been helpful. It’s funny because with the course creation, I feel like the hardest part is the actual production of the videos and stuff whereas the information development is like not as hard because I know what I want to say and I know what people need to learn. So it’s just funny with online courses because on one hand you create them as a practitioner so that way you can provide information to a greater variety of people at a lower price point, that kind of thing, and they can be really helpful for a lot of people to go through these group programs. But I was just realizing I guess it was yesterday or something because I was working on some of the content that so much of the work in creating these programs actually goes into the production and not the information. Laura: It’s funny because I feel like when you work one on one with people you’re providing the same information, or maybe it’s a little bit customized, but you’re talking. I mean it’s kind of like what we’re doing right now. We’re just talking. We do prep for our podcast, but at the end of the day like we’re just talking. We don’t have to create like visuals and stuff like that. I know you hired someone to do the visuals for a lot of your “Build Your Biome” course, which in hindsight I’m like that might have been a nice thing to do. But just with the timeline of the launch and everything, I’m trying to launch it before everything was done, I basically had to do it myself. Finding someone to create it would have been kind of almost more work. Well, maybe it would have been more than creating it myself. Kelsey: It felt like it was going to be more work. Laura: Yeah. It’s just hard to find someone that is going to give you exactly what you want. I’m a control freak which is probably one of the problems in my life is that I like don’t trust anyone else to do what I need to do, so I end up doing it all myself and then exhausting myself. It’s just a funny kind of couple of weeks where I have the program that I’m creating. So it’s in process, but I’m still creating content for it, which is a new thing for me. The benefit of it doing it that way is that I can get feedback from the participants and then create content that is aligned with what they’re looking for as opposed to it just being like fully done and then they’re doing it. But on the other hand, it obviously puts a level of strain on me to make sure all the content is created by the time the modules release. Definitely a little bit of a stressful decision that I made and we’ll see how I feel at the end of November when this is all done. Kelsey: When you’re done, you’re done. It’s a great feeling regardless of how you do it. Laura: I’m not a distance runner, but I imagine this is like running a marathon where you are in mile 5 and you’re like, oh my gosh, why did I sign up for this? And then you get to the end and you’re like, oh I feel so great that I finished! Laura: It’s funny because…well it’s not really funny. It’s just I feel like when it rains, it pours because my dog a couple weeks ago tore his like dog version of the ACL. Laura: I know. And the funny thing is like he didn’t really seem to care that much other than just not using that leg. He was just walking around on three legs for the last couple of weeks. So I had to take him to a surgical consult and it turned out that the ligament was fully detached and they had to do this like really crazy surgery. It’s called a TPLO, which I think stands for tibial…gosh what does the P stand for? I feel like it’s like protuberance or something. I can look it up really quick. Oh I’m sorry, not protuberance, Tibial Plateau Leveling Osteotomy. Basically the tibial plateau is like the top of the tibia. Basically you know how your joint, like your two bones will kind of like stack on each other? So dogs have that, it’s just in a different angle. Ours is straight up and down whereas a dog is kind of like… I don’t know, maybe a 90 degree angle or something, like less than 90 degrees. The bones kind of stack there. But the CCL ligament has to keep them from shifting. If the CCL ligament is not there, then the top bone, basically the femur can just slide and it slides back and forth. It can hurt and it can cause like rupture to the bursa between the joint and everything like that. It can cause pain, inflammation, but also just instability in the joint that usually will freak the dog out and he won’t put his weight on it. And so they had to do this whole thing where they actually like cut the top of the bone off, like fully detached it in this arched kind of cut and then like rotated it so that way the angle of the tibial plateau changed so that the femur rested on it and couldn’t slide. And then they put a plate in there to stabilize it and then eventually the bone kind of grafts itself together. Laura: It’s crazy. I was thinking when they said CCL surgery that they would just be like reattaching the ligament, but it turns out that’s not a very effective way to repair this issue. Kelsey: I saw your Instagram photo of his poor little leg. Laura: I know. He’s got all this like fluid at the bottom so he’s got like the biggest canckle you’ve ever seen in your life right now. It’s like super red and he’s not allowed to lick it so sometimes I have to put this cone, which I feel like for him the cone is the most traumatic part of the whole thing. He can’t walk. I have to kind of like just lead him outside. I used to have to use a sling to carry his back end to make sure he wasn’t tripping or falling or anything. Now I think he’s a little bit more stable so I haven’t been using it. But oh my gosh, there’s like eight medications I have to do. It’s like the timing and the expense has been really poor timing. I mean luckily, and this is like a disclaimer to anyone that has a pet mostly a dog, I don’t think cats really are at as much risk for this. But any pet at all that you feel like you wouldn’t want to just like put down if they had a serious issue. Get pet insurance because I have it, I pay like someone in the 30 to 40 a month range. I can’t necessarily confirm this, but I’m pretty sure the insurance is going to cover a large like maybe 80 percent of the cost of the surgery. Kelsey: I mean I only have a cat now. But my cat that passed away last year she like ended up getting really sick and like needed medication and stuff like that. It adds up. Obviously a surgery is going to be way more than that. But like even that to me, I wished I had pet insurance at that point. When we got our new cat I was like all right we’re getting pet insurance for sure. Laura: Oh, so you have it, too. Yeah, it’s one of those like hindsight is 20/20 experiences. Luckily with my last dog my parents funded any of the like major medical treatment that she needed, which in some ways was like less than Levi. Levi is only like three years old. But when my when I first got the dog, my vet encouraged me to get the insurance. I was really glad that I did because I think it’s going to like I said cover the majority of the surgery and there’s a chance in these kind of situations that the dog may need this exact surgery on the other knee at some point. It’s just like oh my gosh, this poor dog. I just don’t understand how he like has these problems. But it’s just been kind of an emotionally and just like mentally stressful experience because obviously I don’t like seeing him in pain, or sick, or dealing with like the medication. I have this whole like medication schedule written out and it’s just a lot of things going on. It’s funny because like I said, I was so excited for the post-wedding experience because my husband moved in with me and the wedding planning was done. I was like our stress levels are going to be so low. I’m like why don’t I feel more stressed right now than I did before the wedding? It’s funny because I feel like I’m handling it okay, but I can definitely see how some of the stuff is affecting me health wise. I just noticed the other day Josh and I went out for a walk and I was like can we just like pretend like we’re walking the dog and go walk somewhere because I hadn’t really been walking. I’ve been on the computer so much this week and I started to notice this hip discomfort that I’ve had in the past. Basically it was right after my car accident when I was pretty much like laying on the couch all the time for a couple of months. I was having this discomfort in I think it was like my left hip. I can’t remember this second. But essentially if I would take longer walks, I would start to get this just somewhat of a pain in my hip. I recognize it as the same pain I was getting when I was in that post car accident situation. I’m like I bet this is because I haven’t really been walking in the last, I don’t know probably six weeks because of the dog being injured. So now I have to figure out if, I’m like am I going to just like take walks by myself? I guess I have to. I guess I should practice what I preach. But it’s like having a dog makes it so much more just intuitive whereas right now I’m like oh I have to like go on a walk to make sure I’m not just sitting all day. I tend to be prone to anxiety and if I’m like stressed, and working nonstop, and that kind of thing, it’ll kind of trigger the physical symptoms of anxiety for me, which is sort of annoying. It’s like I can be going to bed and then all of a sudden feel super anxious about who knows what. Like maybe it’s just all the stuff I have to get done the next day and I can’t really like shut it off. That’s been something that I’ve been trying to figure out how to deal with it because I have some like nutritional and supplemental strategies for it. But at the end of the day, I know what the reason is and it’s like do I just like power through the next six weeks? I forgot to mention this because we talked about it a little bit before we got on the phone is tomorrow based on when this podcast is publishing I’m actually doing a day long seminar at the Weston Price Conference, which it’s the same seminar I did last year which makes it a little bit easier because I don’t have to do any prep for it other than just like reminding myself what I’m talking about. Laura: But it is a different setup where last year it was like a small group, and I sat down for it, and it was like a small room. I was still pretty nervous before, but I think I felt more comfortable because it was like just a group session essentially. This time I’m going to be on a stage and I have no idea how many people are going to come to it. I’m probably going to be like super stressed. I was saying to my husband like I’m pretty sure I’m going to have a heart attack like before the end of November. Laura: Yeah, seriously. But it’s just funny because I’m like why did I commit to all this stuff all at the same time? I have no idea. I think I just wanted to make up for some of the lost time earlier in the year with all the wedding stuff going on and definitely over committed. I feel like I’m learning, well I’m not learning. I feel like this has been an issue for years where I overcommit and start to do too much and then I don’t feel great. And then it’s like alright, try to prevent an adrenal fatigue situation since I feel like my adrenals are finally back on track. It’s like let’s see if I can minimize the damage here and then once all of this craziness is done, I need to take a break. Because like I said, I need to practice what I’m preaching with our Paleo Rehab program, and our clients, and all that stuff where it’s like I’m telling them to reduce stress or implement stress management practices. Right now I’m trying to do that as much as possible, but I’ve definitely made some decisions that made my stress goals…. Laura: Yeah, that did not support that very well. It’s a learning experience. Kelsey: I feel like the benefit of our type of job is that yeah, we go through periods of higher stress, but we can also like pull it back a bit after that much more than somebody with a regular nine to five job probably can’t. So there is that benefit. Laura: That is true. Some people are in this kind of state for like months and they don’t have any control over it, whereas I definitely have control. I try to not like feel guilty for doing this to myself essentially. Obviously have no one else to blame except for myself. But on the other hand, it’s like I made the decision, got it just kind of a stick through it for the next I guess it’s like five weeks at this point maybe to get through it. Once it’s over, I’ll be happy. I’m kind of thinking about this whole year and I’m just like what was I thinking trying to do this all? I think sometimes you get the impression from other business owners that it’s possible for everyone to work hard. You and I were talking about this before we got on the call that there are certain people out there that it just seems like it comes naturally to. I think throughout this year I’ve discovered that it does not come naturally to me and this is probably not a level of work that is sustainable for me. We’ll see what happens. Kelsey: Yeah, you and me both. Laura: I think we are both in the same plate, which on one hand it’s frustrating because it’s like I don’t like feeling like I’m going to get sick whenever I work too hard. But on the other hand, we can’t all be workaholics. Laura: I don’t want to promote that in my work and I don’t want to make other people believe that they should be doing that. So now I just have to like commit to not doing it in my own life, which is the hard part. Kelsey: Now after this this conference, time to chill. Right, Laura? Laura: Yes. It’s early November when this comes out. You guys need to check in on me and hold me accountable to chilling in the month of December. We normally record about a month or like at least three weeks in advance. Check in on me in November and make sure I am relaxing. At the end of November, I should say. Kelsey: Well the good thing about December is that it tends to lend itself fairly well to relaxation. Laura: Yeah, nobody wants to talk about nutrition in December. I’m happy to not talk about it either. Kelsey: Perfect. Well I hope you get through this all just fine that you have the ability to relax after it’s all said and done. But I’m proud of you for getting this out into the world. Like I have told you, I think it’s a really awesome program and I admire your dedication. Laura: Thanks! Yeah, I feel like once it’s done I’ll be able to see a little clearer. I have a hard time with seeing the long view when it comes to things so I get very caught up in like what’s happening right this minute. I’m sure once I have kids that will change. I’m hoping it will change because I feel like having a baby is probably a lot harder than what I’m doing right now. Laura: I’m like if I can’t even handle launching a program, how am I going to launch a human? But we’ll see what happens. Kelsey: I like that term: launch a human. Laura: Yes. Well like I said, just keep me keep me honest with my plans to chill out in the month of December. Laura: Alright, well thanks for joining us, everybody. We will see you here next week. Kelsey: All right. Take care, Laura.